What does the double zarka mean grammatically, and why is it only in these places? In a clause ending in segolta, the dichotomy is marked by a zarka, if in the first, second, or third word away from segolta. 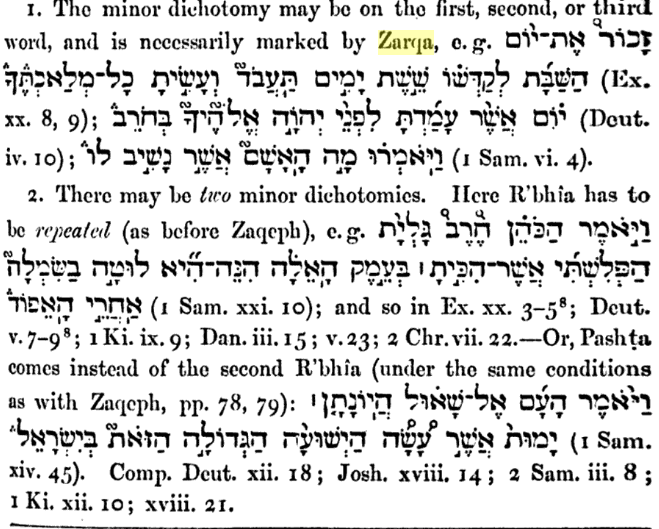 If the dichotomy occurs further away, then it is marked by revia or pashta, and then the second minor dichotomy (in the intervening clause, from that revia until the segolta) is marked by the zarka. However, on musical grounds, if the revia or pashta is in very close proximity to the zarka, it is itself turned into a zarka. See William Wickes, A Treatise on the Accentuation of the Twenty-one So-called Prose Books, pg 87 - 88. Practically, we can see what this means by taking on of the example pesukim, such as the one in Bereishit. The major dichotomy (division in two) happens at the etnacha, on the word שָׁמָ֑עְנוּ, and thus from וַיֹּֽאמְר֞וּ until שָׁמָ֑עְנוּ is the first half of the verse. That half-verse is in turn divided in two by a minor dichotomy, a zafek type, namely the segolta at אָחִינוּ֒, such that from וַיֹּֽאמְר֞וּ until אָחִינוּ֒ is the first half, and from אֲשֶׁ֨ר until שָׁמָ֑עְנוּ is the second half. The division is on the word אֲבָל֮, "indeed, verily", separated from "we are guilty regarding our brother." 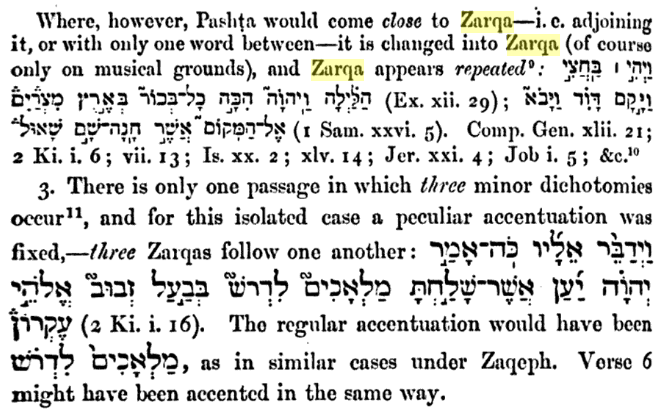 This would be properly marked by a revia, but since it is two words from the eventual closest zarka (on אֲנַחְנוּ֮), it is itself transformed into a zarka. Usually only the last Revi'i note before a Segol becomes a Zarka. In general the note Revi'i doesn't like to be next to itself (probably a musical consideration). So if there are two in close proximity, the second one changes to a Pashta (eg. Genesis 1:7). So grammatically it means nothing different than the Revi'i you might have been expecting. How to read a mahpach psik?